" How lucky we all were to have know that great man that was Martin, in whatever weird or wonderful context!!" For those of you who do not know, then I am really sorry to have to tell you that Martin died on the 27th May, 2004. He leaves behind his wife and two daughters and an enormous number of people who thought of him as a friend. Martin took up the role of PRAS chairman when the Society was going through a period of turmoil. He used his inimitable diplomatic skills to help the club bounce back to the strong group it is now. He brought stability and humour to the committee meetings and forged strong links with the FBH. This resulted in our last breeders meeting being the success it was, and in the planning of our next breeders meeting – planned for October this year. He was also a keen fisherman, loved motorbikes (especially really noisy ones) and powerful cars. 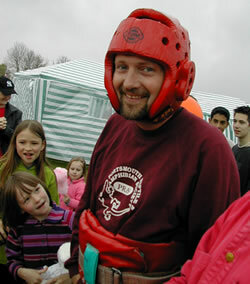 He shook up not only PRAS and the FBH but also the Bishops Waltham council. His health problems sometimes stopped him doing everything he wanted (much to his annoyance) but he was active in all aspects of the society as much as he could be. For a chap who originally said he wasn’t too much into doing displays he seemed to enjoy those that he helped at and arranged a couple of displays at villages near Bishops Waltham. The pictures of Martin in the crash hat were taken at one of these shows (at Lower Uppham, I think) when he had a go on a ‘Bungee Run’ – all the while wearing a PRAS sweatshirt! On another occasion he ran 5 miles dressed as a newt. On another he cycled across the country to raise money in memory of a friend. He was renowned as a staunch supporter of conservation projects being responsible for saving a lovely stretch of land from becoming a car park amongst many other successes. His knowledge of native animals was fantastic and while browsing in a pond he would rattle off lots of names, latin and common, (none of which I can remember!) to teach me (or whoever) about the weeds, snails and anything else that could be seen. My thanks go to Martin for being a friend. My (our) love goes to Kath, Isabelle & Rhiannon, who can call on me at any time. How lucky we all were to have know that great man that was Martin, in whatever weird or wonderful context!! ps Never stop cherishing your loved ones!